The goal of the game is to move all cards from the 16 layout piles to the 8 foundation piles located at the bottom of the screen. This game is played with two sets of cards, comprising A, 1-10, J, Q and K each, with Ace playing as both high and low. To access cards further down in a given column on the Layout, cards can be sorted into sequences, provided they are of the same suit. Cards can follow on from each other by going up or down by one number. When a column is empty, the space can be used to start a new sequence with an Ace or a King. The Foundations are built on one set of Aces and one set of Kings. Cards of the same suits need to be added in ascending order on the Aces, and descending order on the Kings. Cards can also be moved between Foundation piles and from the Foundations back to the Layout. When you’ve run out of moves feel free to use the Shuffle button. This can be used up to three times and will bring the bottom card from each column to the front, without disturbing the order of the rest of the cards. A round is won when all 104 cards are filed to the Foundations. 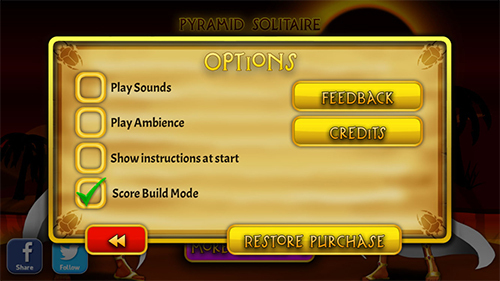 For a high score try to win several rounds of Crescent Solitaire Classic in one game. ‘Take points’ at any time to finish a game. Round Number × 1,000 points.